In response to a request from Elizabeth Cooney and Elisaveta Blumina, a short movement was written for a concert in the "Con Brio" series in Sligo, Ireland in March 2011. This subsequently became the first of five forming a much larger work. 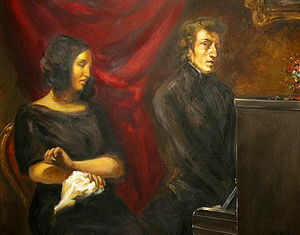 The starting point was the saga of Chopin's ill-fated time on Majorca with George Sand. Oddly, I must confess that this composer's music is not particularly dear to me. But.. a good story...: his beloved piano was impounded and, after an initally blissful sojourn, the "couple" found themselves the subject of scandal owing to the fact they were unmarried, leading to them becoming penned in at the monastry at Valldemossa. My piece paints a pitcure of the composer's state of mine. The first movement Portrait: Chopin (after the manner of Schumann's in Carnaval), is a little character sketch rather than any attempt to imitate or be referential to the composer's sound world. Here, though, he is not "the dreamer poet", but the storm-tossed Romantic of the Revolutionary Etude. The four nocturnes which follow are certainly not at all Chopin-like - I never wanted to write a Mozartiana. They are by turns shadowy, poignantly lyrical, nightmarish, and finally valedictory (the poem Invictus by W.E. Henley seemed to capture the mood). This piece contains no pastiche, and references to the composer's style are not to the fore, though perhaps some of his figurations are already assimilated into my vocabulary, most notably the "turn". The first complete performance of the work was given by Ostap Shutko and Miroslav Dragan at the Philharmonic Hall in Lviv, Ukraine in October 2011. It has subsequently been played by Irina Borissova and Giacomo Battarino in Italy (video on next page).